Inducted 2010. State Runner-up 1990 Class A State Golf Championship. Class of 1991. Dailing was just a five-foot put away from winning the 1990 Class A state golf championship, putting him in the same company as another individual who was the state runner-up, D.A. Weibring. 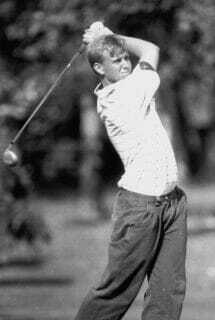 Dailing, a 1991 Notre Dame graduate, placed 11th individually during his junior season at the 1989 Class A state golf championship. During his senior season, he averaged 39.1 strokes per nine holes. Entering the state tournament, Dailing had played 207 holes and recorded a score of worse than a bogey just 16 times. He parred or birdied nearly 60 percent of the holes he played. He won the regional medalist honors by five strokes, and he placed second at the sectional in Monmouth. Dailing carded a 78 in the first round of the state tournament at the Elks Club in Danville, but he turned in the best round of his career on the tournament’s last day. His round of 72 put him in a four-way tie for first place at 150, but Massac County’s Matt Armstrong was the only one of the four players to par the playoff hole. 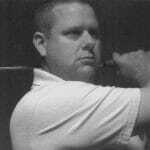 Dailing went on to play collegiately at Southern Illinois University, lettering in 1993 and 1994. His first-round score of 67 at the Bent Creek Classic during the 1994-95 season ranks among the top 10 single-round scores in SIU history. Dailing lives in Quincy with his wife, Sarah, and his children Grace and Parker. He is a human resource specialist at Knapheide Manufacturing. First, let me say thank you to the administration, staff and committee members of Quincy Notre Dame. Being inducted into the Hall of Fame is a tremendous honor and something I will always remember. I tried to think of a ward that summed up my golf career and my life as a whole, and the one word that I kept coming up with was “blessed.” God blessed me with a great coach and teammates. Coach always knew the right things to say to help me relax, enjoy myself and perform as best as I could. My teammates were a blessing. We were more than teammates. We were all friends and remain friends to this day. God blessed me with supportive parents who knew when to push me and when to step back and let me push myself. I never will be able to repay the sacrifices mom and dad made to allow me to play golf and attend QND. The Lord continued to bless me with a wonderful wife and children. Sarah, Grace and Parker are living proof that God is great and wants us to be happy.